Chef Christopher Kafcsak entered Cleveland’s culinary scene through the produce aisle. 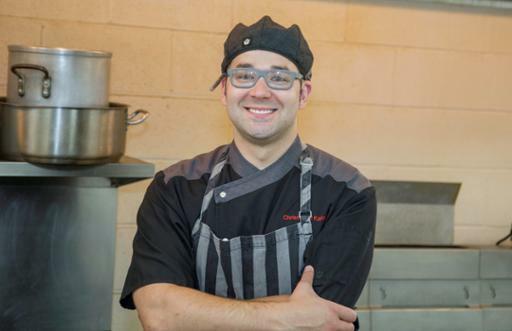 Long before he sharpened his cooking skills at Cuyahoga Community College and opened Nomad Culinary, Kafcsak worked at the Northern Ohio Food Terminal supplying restaurants with the fresh ingredients that make meals come to life. He filled orders ranging from common goods like lettuce, tomatoes and onions to exotic selections like the tentacled fruit dubbed Buddha’s hand. In that job, he said, produce served as a commodity to buy and sell. Kafcsak took the knowledge that he gained at the College and put it to use in a mouth-watering list of Northeast Ohio eateries, including Cibreo Italian Kitchen, AMP 150 and Washington Place Bistro. In 2015, the rising star on the Cleveland food scene landed the executive chef position at Deagan’s Kitchen and Bar. His focus now is on building Nomad Culinary, a cook-from-scratch catering company he owns and operates. Kafcsak creates custom meals in Nomad’s Broadview Heights kitchen that add a wow factor to events across the region. He also has worked with the College to create hands-on work experiences for students, particularly regarding cooking for large events. In addition, Kafcsak is part of the Culinary Council guiding Tri-C’s Cleveland Eats Culinary Festival. The festival, now in its second year, will take place Sept. 15 at the Mall B outdoor event space above the Huntington Convention Center of Cleveland.